After you memorize the G major chord pattern, you can instantly play the chords in any new key on the guitar simply by moving to a different position. For example, move the whole chord pattern up two frets and play in the A major scale. Or move up four frets and play in the B major scale. Wherever you begin this pattern, the 1st scale degree is your key. No matter which note you start on, you always produce the correct chords for that scale. The best part is that you don’t have to concern yourself with the actual notes and chords you use; just pick a starting point and play the numbered pattern as shown here. That’s all there is to it! 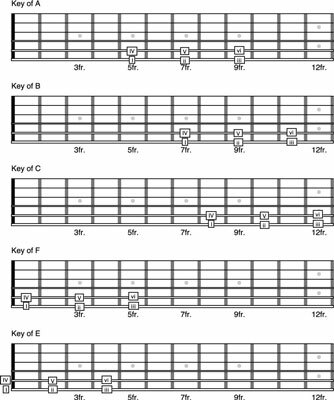 With this chord pattern, all keys look and feel the same. Just keep track of the note on your starting point, chord I. Notice that this pattern also works with I and IV as open chords in the key of E.